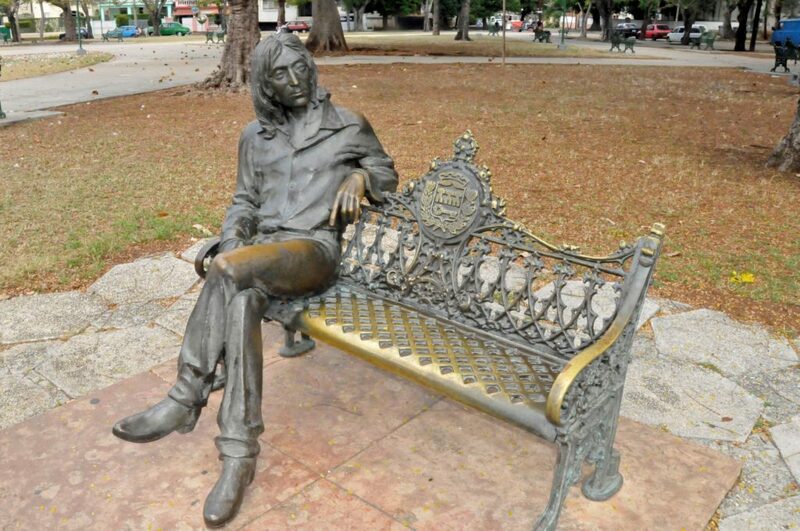 Among the most unexpected sights in Havana, Cuba, are a small park bearing a statue of John Lennon and a nearby bar devoted to music that Cuba previously banned. In 1964, soon after The Beatles had appeared on the Ed Sullivan Show, Cuban dictator Fidel Castro issued a nationwide decree banning The Beatles and their music as the supposed product of the decedent capitalist system. However, by the late 1990s, motivated at least in part by Cuba’s desperate need for revenue from western tourists, Castro’s attitude toward the Beatles changed. He now pictured John Lennon as a revolutionary martyr because of his opposition to the Vietnam War. Busloads of tourists soon began coming to Parque John Lennon to have their pictures taken sitting beside the famous Beatle. The round eyeglasses were stolen so often that they are now guarded. In April 2011, the Cuban government opened Submarino Amarillo (Yellow Submarine) just east of the park. In the lively bar featuring blue and yellow walls covered in images of The Beatles and lyrics of their songs, Cuban musicians play music from the 60s and 70s that once would have led to their arrests.